The first doctor in Blackville was an English Army doctor by the name of William Idear. In the late 1700’s in what is now the village of Blackville, he was given a grant of 125 acres for his services rendered in the British army. The doctor settled on a small island which is now known as “Doctor’s Island”. Dr. Idear made his own medicines from the many wild herbs that he grew on the island. In the mid to late 1900’s a botanist visited the island and found at least 170 different kinds of herbs growing there. Doctor Idear had a wife and two daughters, Isabel and Maggie. Dr. Idear treated the people in the village for a number of years. He later moved to another island somewhere between Blissfield and Doaktown, where he stayed until his death in 1833. The next doctor was Dr. Blazdell. He too made his own medicine from herbs. His office was in the front room of William Underwood’s and he boarded at the McConnel Hotel, situated on Station Street, near the Blackville Train Station. Next was Dr. Keiller, who had his office at the Grindlay Store, located where the Blackville Post Office now stands. He was here during the small-pox epidemic and was first to vaccinate in the area. His successor was Dr. McManus of Irish descent from Prince Edward Island. He was married to Mary Ford of New York City, a niece of Rev. S.J Crumley, a parish priest here at the time. The next resident doctor was Dr. John Beaton, son of Rev. Laughlin Beaton of Cape Breton, N.S, who had been minister of St. Andrews Presbyterian Church from 1912-1917. Shortly after Dr. Beaton graduated from Dalhousie and McGill Colleges, he started doctoring here in 1913. He married Helen Alcorn, a Registered Nurse, daughter of Archibald Alcorn Sr. of Kelso, Scotland. Dr. Beaton had one son, Archie. Dr. Beaton died of the age 65 in 1953. His wife born in 1886 died at the age of 67 in 1953. During the booming years of Blackville, Dr. Beaton was instrumental in having a drug store established here. Shortly after Dr. Beaton’s death, the next doctor came to us from Saint John, Dr. Boudrea, who with his wife Valerie Moffard, a registered nurse, resided here for three years. During that time they had two children: Jo-Anne and Michael. In 1956, Dr. Boudrea left to take a post graduate course in surgery at Buffalo, New York, which he completed and then returned to Saint John to continue his practice. Later that year, another young doctor came to Blackville. He was Dr. William MacKay, of Scottish descent, born in Clinton, P.E.I. and a graduate of Prince of Wales College, Charlottetown and Dalhousie University, Halifax. He brought with him his wife, Marion Halverson, a registered nurse, of Magagash, N.S. Since then they had two girls, Heather and Jill and a boy, Willard. In 1960, they built a large home on Main Street in the center of the village where they lived. He held busy office hours from 2pm-9pm every weekday except Thursday. He traveled twenty-five miles every morning to tend to his patients at the Miramichi Hospital at Newcastle. Dr. MacKay had a heavy schedule serving a large territory. At that time there was only one doctor between Stanley and Newcastle. In 1963, Dr. MacKay moved his practice into the town of Newcastle, now City of Miramichi, where better facilities were available. Since his departure he had two girls, Mary-Lou and Jo-Anne. Dr. Garnham was the next doctor to reside in Blackville. He set up his practice at the corner of Station Street and Main Street. He left Blackville in February, 1966. The majority of the people from Blackville then traveled to the Newcastle Hospital for their medical attention under Dr. MacKay. 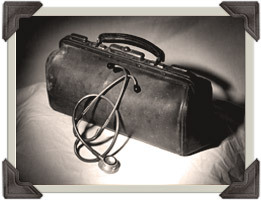 In the years following many doctors visited the area until a new resident doctor arrived. Dr. Bill O’Flaherty from Newfoundland was the village doctor for many years both at the old medical clinic (former village office) and the new Blackville Health Center on Shaffer’s Lane. After Dr. O’Flaherty left, Dr. Nina Zigante became the new resident doctor. She, along with Dr. Arthur Losier of Miramichi, currently treat the residents of Blackville and surrounding communities.